Legs and the way organisms use them are signposts of the evolutionary process. Bi- and quad-pedal movement is for us silly mammals. Insects are the ones on the higher end of the evolutionary ladder. Take a look at this beetle for proof. 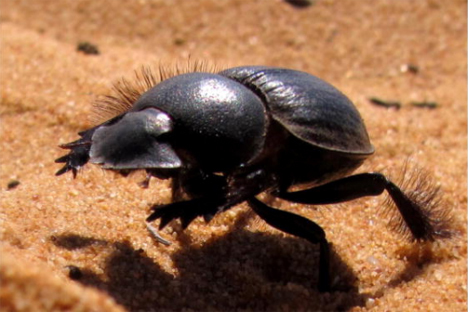 Three separate species of dung beetle have scientists baffled with the way they seem to gallop. The reason for this odd form of travel isn’t fully understood. The typical tripod gait most insects utilize is much more efficient, leading the layman to conclude they’ve forgone the normal bug walk for some type of cocky strut. Entomologists, however, are more logical. “The very marked pacing…might be giving it a better signal in terms of estimating the return distance from the food to its nest. When it gallops, it slips less in the soft sand,” explains Marcus Byrne, professor at Wits University in Johannesburg, South Africa. See more in Earth & Nature or under Science. November, 2013.